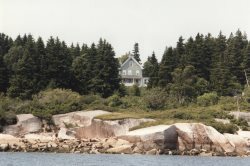 Changing Tides is a inspiring, secluded oceanfront log cabin in Deer Isle. Enjoy being off-the-beaten path as you watch the tides roll in and out, while soaking in all the beauty and peace our little island has to offer. Changing Tides has a grandfathered building site sitting just above the shoreline which leaves you with ocean on three sides of the cabin. Changing Tides is a two bedroom, one bath cabin. The home has a well-stocked kitchen with a dining nook and gorgeous views of the cove. Walk from the kitchen out in to a living room/dining room combination with comfortable new furniture and striking views from all windows. The dining room area of the cabin has a large table which would be great for entertaining some friends or wining and dining with a loved one. Changing Tides also has a comfortably furnished sunroom where you can bird watch in the cove, curl up with your favorite book, or just take an afternoon nap. There are two bedrooms at Changing Tides the first bedroom has a queen sized bed with night stands, a dresser and closet. The second bedroom has two twin beds with a closet. Changing Tides is comfortable for one to four people. Changing Tides has a newly renovated studio space. The Studio at Changing Tides is furnished with a large desk for work related projects. There is a full bathroom in the space as well as a small kitchenette. The Studio at Changing Tides is furnished with comfortable furniture so you can pull up a good book and relax, get caught up on those work items that may still be outstanding or just take in the sites of the cove in this quiet and comfortable space. Come and spend some time in this seaside cottage on the beautiful Maine coast. Changing Tides has a collection of kayaks available for tenants use to enjoy a paddle around the cove. Coastal Maine is waiting. Book your time in this unique cottage today. Pets: Pets are not allowed at this rental property.